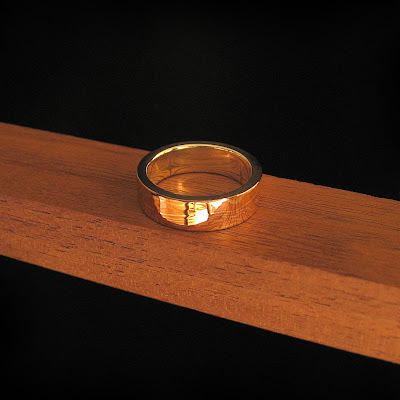 This was a custom order for an 8mm width Mokumé Gané band. I thought it would be nice to record some of the process to share with anyone interested. Enjoy! I'm finally getting this contemporary wedding band set up for sale. 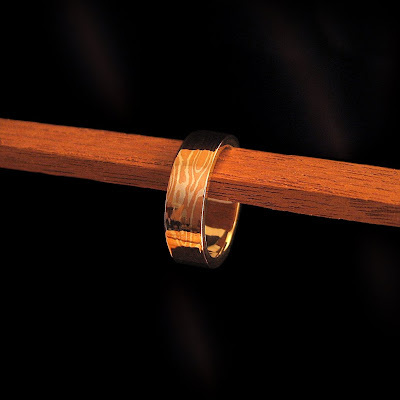 The center band is shown 'frosted' in this set... but it could also be hammered, satin, or highly polished. 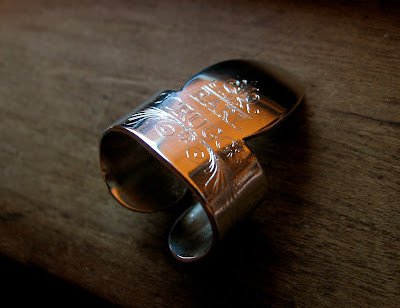 This is the Mokumé Gané ring that I've anticipating making for so long now. It turned out better than I thought. This ring sees some pretty intense heat to join all the elements together. 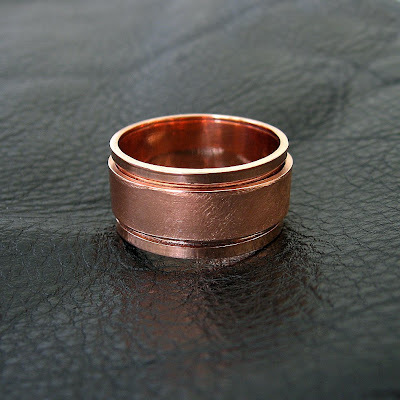 I've wanted to try to make one of these spinner rings for a while and last night I had some time so I went ahead and made one in copper. Twas much fun. The ring did take longer to make than I anticipated. It is rather large at size 11 or 12... I'll make a smaller one next time. 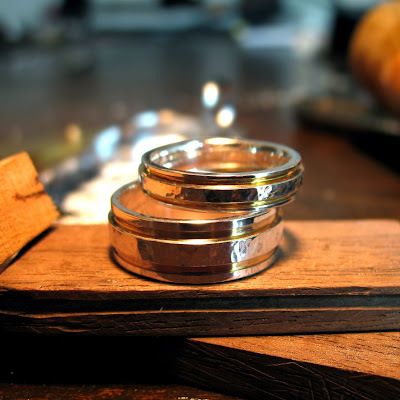 The photos in this post show some of the different stages of a nickel silver ring I recently made for my wife. She likes darker colored white metals like white golds and stainless steel. Nickel silver also has this characteristic darker color. A lot of people have an allergic reaction to nickel against the skin so I don't offer any nickel items for sale unless it's a non-pendant guitar pick (and I only make nickel ones by request). 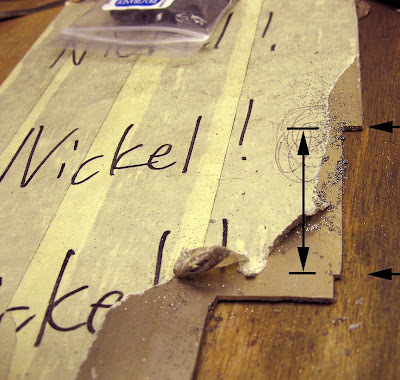 The above photo shows the strip I cut out from a 1.29mm sheet of nickel silver. You can see where the strip was cut out by the reference arrows. As you can see, I label all nickel stock very clearly. The strips' ends had to be trued and cleaned before soldering. This alloy generally doesn't create as strong of a solder seam as other alloys used in jewelry. After soldering, the ring is sized to just a tad smaller than her actual size. This leaves me room to file and polish (finish) the inside which will leave it the exact size desired. Here, the outside of the band is filed and made uniform in preparation for the next step. 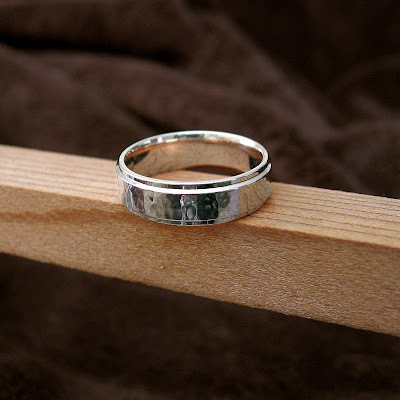 Though a little difficult to see in the photo... the outside of the band has been given a 'frosted' finish to compliment the highly polished outer bands the ring is about to receive. 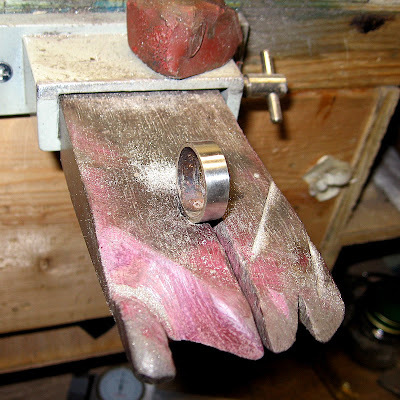 The two outside bands are cut and polished. 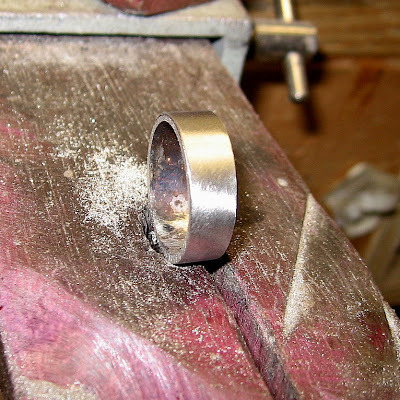 The sides of the ring are also trued and ready to be polished as well. Here is the finished product. 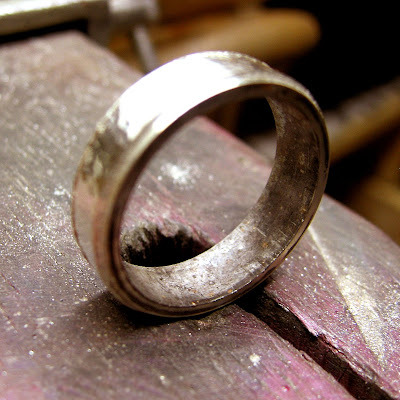 After all other steps are completed, the inside is filed, polished, and ready to be engraved and worn. The ring is shown next to the sheet that it was taken out of. This ring is a personal favorite. It calls to mind ancient gold rings that were hand forged. I have therefore called it "Relic of Antiquity". They seem to be well liked thus far and I enjoy making them. The above picture displays the ring in rose gold but it could just as easily be made in yellow 18k, 22k, or even 24k which would be really cool. 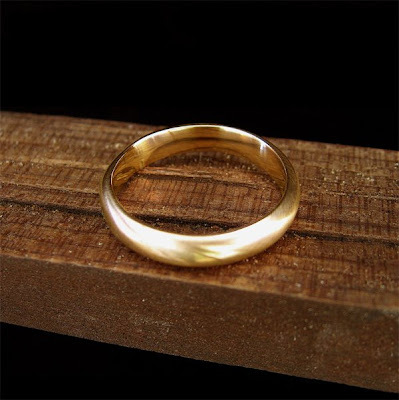 This is a simple 10k yellow gold ring thats on sale in my Etsy Shop right now. 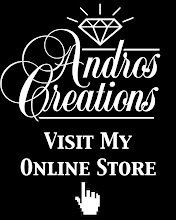 I've lowered the price quite a bit in order to promote my shop. The finish shown is brushed but it could be made in a high gloss, hammered, or 'frosted' finish too. 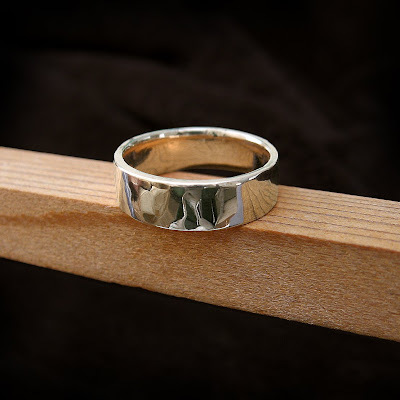 Here is a lovely 14k White Gold band that's hand forged. It has a nice weight to it and can also be finished however the buyer pleases... Available in my Etsy Shop. 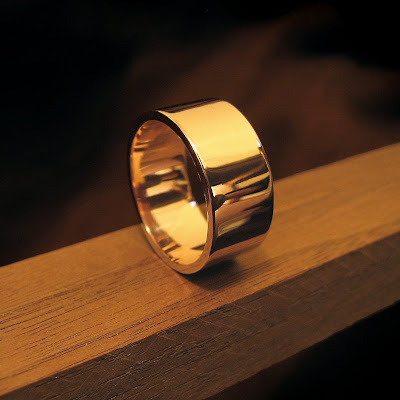 Here is a tiny stacking band made of a deep yellow 18k gold. 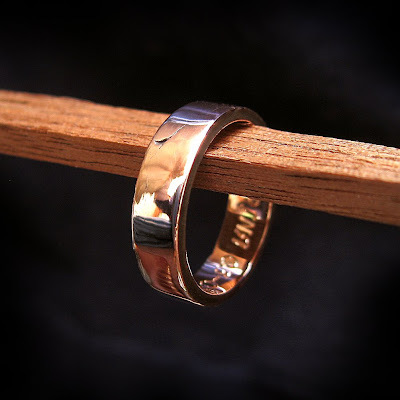 The band has a 1mm width and looks best when several are worn at a time. Also available in my Etsy Shop. These finger picks were a fun challenge. They are prototypes of a set I'm making for Earl Scruggs. 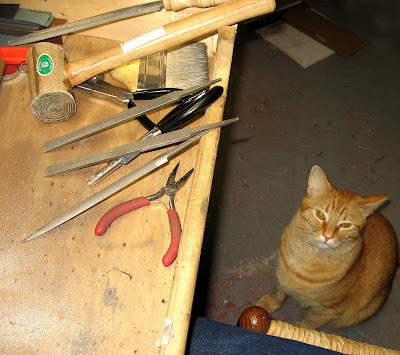 I've found that there doesn't seem to be anyone out there making silver finger picks. These are just prototypes and I haven't decided on a final design yet but I'll be sure to post some pictures of the actual set. 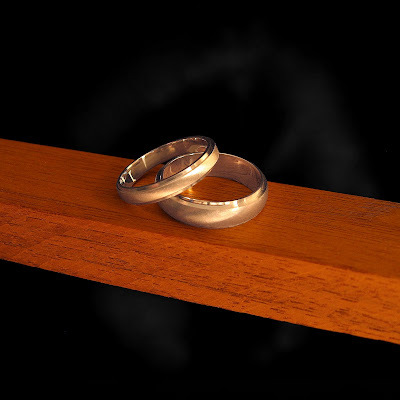 This post displays a set of four photos back when I did my very first set of wedding bands. 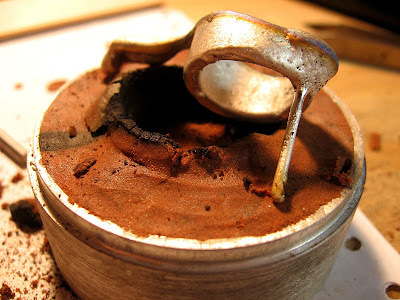 I made an alloy of sterling silver and poured it into the above clay casting flask. This is what the casting looked like before I pulled it out of the mold. 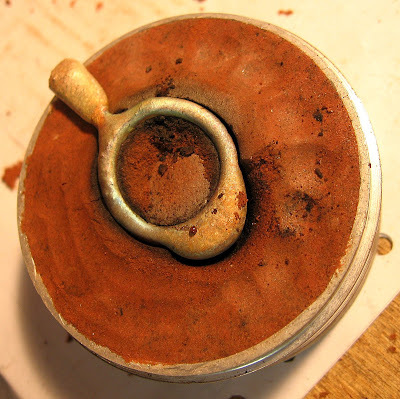 Here you can see one of the vent holes that filled with silver on the opposite side of the pour. 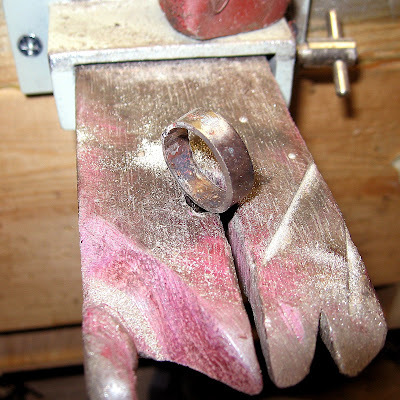 The casting was then sawn, the bands sized, and then hammered and machined. 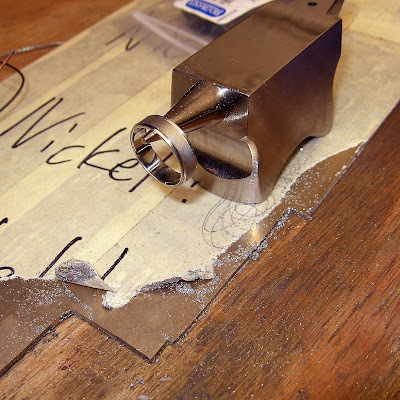 The above photo shows the completed bands... hard to believe this is what was hiding inside that ugly hunk of metal. This is a silver pendant I made about a year ago... 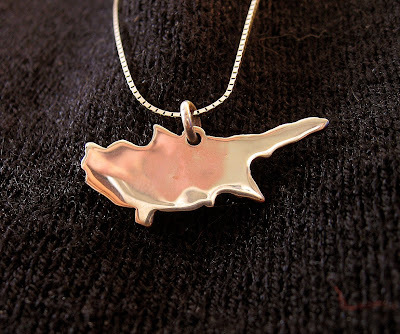 It's shaped like the island of Cyprus where my mother was born. 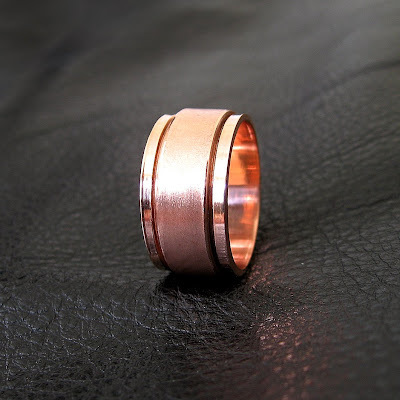 It consists of two thin sheets of silver with a thicker sheet of copper in between. 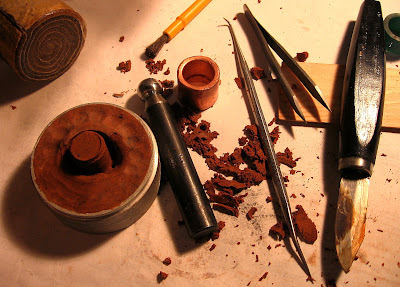 I included the copper because of the historic relationship between Cyprus and its copper production. The Romans called copper "Cyprium" which was eventually shortened to "Cuprum" which is the root of the English word "Copper". 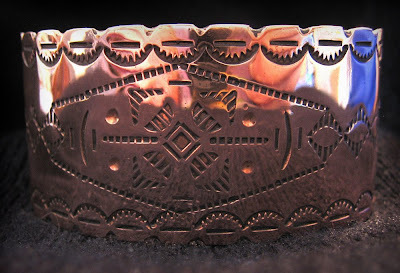 Here's a copper cuff that I made about a year ago. 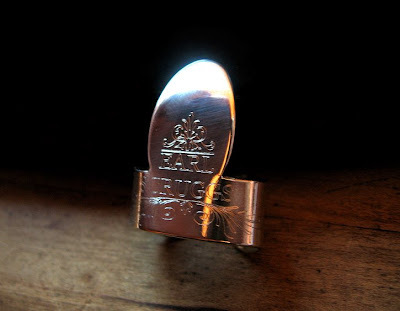 It was hand stamped using stamps I created from steel rod. Here's a unique ring that I made a few months ago for Jenny at http://www.jennybunnycreations.com/. The ring is about half an inch wide and the inside has a thick layer of sterling silver so it won't turn her finger green. 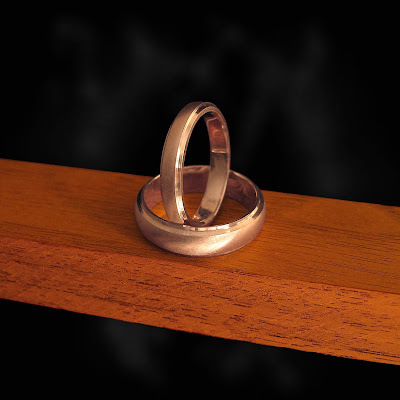 Here's a uniquely alloyed ring that I created for my sister, Marina. 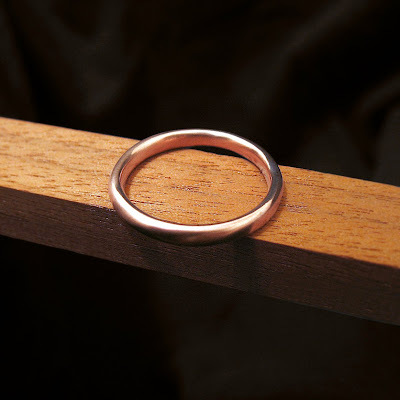 The ring is meant to look very rough around the edges but highly polished on its broad surface. 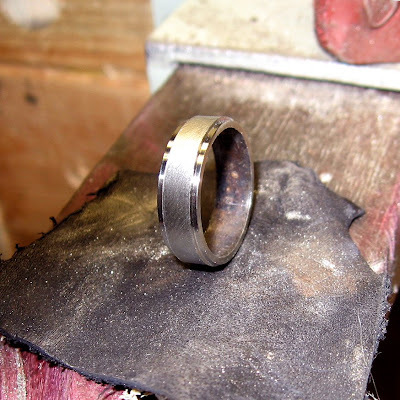 I'm anxious to see how the ring will take a patina. The alloy is about 250 parts pure silver to 750 parts pure copper.... similar to the Japanese alloy called Shibuichi. My sister and I both like to rose look of copper and rose gold. 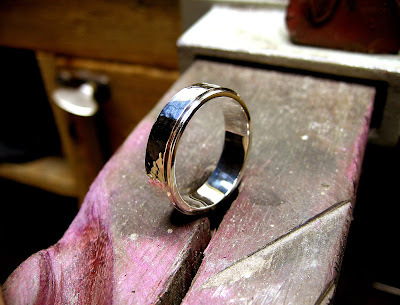 This is a "rose silver" which makes a very neat hue from the inclusion of silver in the alloy. I'll soon be delving into the world of Mokumé Gané which is metal that looks wood grained. 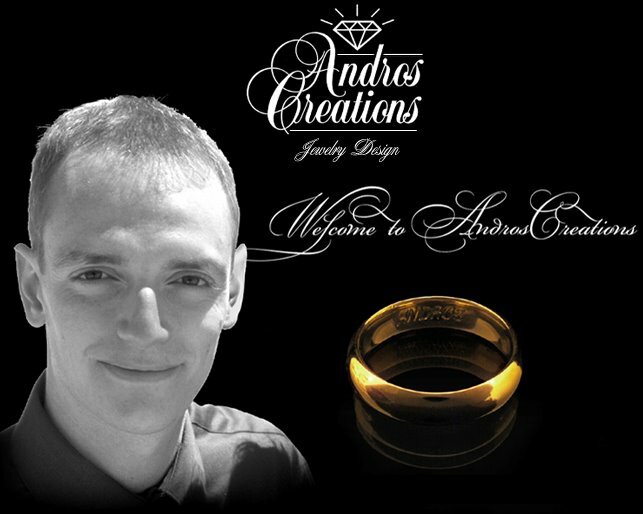 I'll be sure to post some of the rings when I get around to making them and eventually offering them for sale. 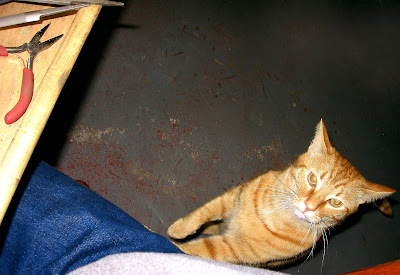 Here's lord Arlington desiring to know when I'll be done and gone so he can, once again, dump my quenching container into my sweeps drawer and carry my wire solder all over the house. 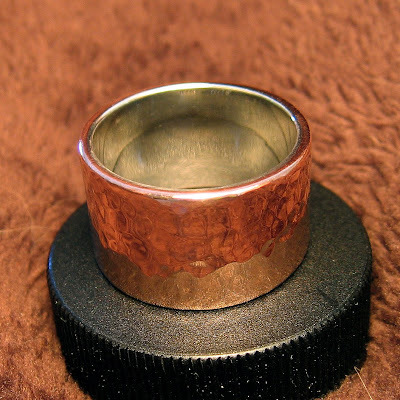 The inside of the band is highly polished and all edges are cleaned up... I just need to engrave the inside of the band and put it in the mail. Yes, Arlington... I'm done. You can use the bench now. The purpose of this blog is to discuss my current work and display photos in a non-formal way. Lately I've been working on some new rings that I'm excited to get finished. 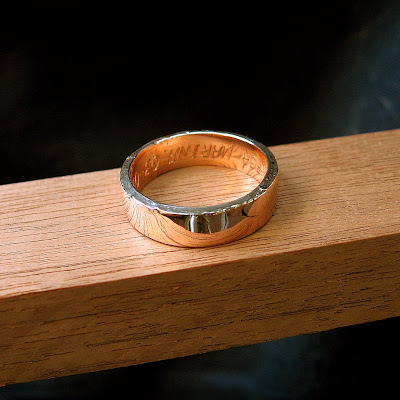 I'm trying to offer more finishes and allow the buyers to customize their wedding bands if they please. Here is a new chunky 14k yellow band that I've completed. I'd also like to make this in a 2mm thickness which I plan to do. 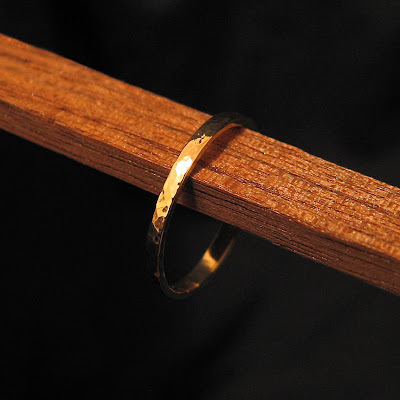 I just completed a little 18k wedding band for a customer who wanted a frosty looking finish. I'm hoping she'll be pleased with the results. Jewelers can get this kind of a texture from sandblasting a piece during the finishing process... but not being equipped with a sandblaster, I found another way to achieve this frosty look. I call it, appropriately, a 'frosted' finish.